​​​A small and still relatively remote region of New Zealand, Waitomo today is an exciting destination for any travellers seeking a subterranean adventure, and a Lord of the Rings fix. Boasting rolling green fields, picturesque hamlets and spectacular rural vistas, the region of Waitomo is certainly a peaceful part of New Zealand. Yet it was not always this tranquil. Indeed, for 30 million years, the region lay at the bottom of the ocean before violent tectonic activity pushed it to the surface. First settled by Māori tribes nearly 400 years ago, the Māori word ‘Waitomo’ literally means “Water Sinkhole” and references the many cave openings that pocket the landscape like swiss cheese. This tomo’s are the entrances to an ancient network of limestone caves that lie beneath the lush farmland. While the Māori knew of the caves in the region, they had not completely explored them until 1887 when the local Māori Chief, Tane Tinorau, and an English Surveyor, Fred Mace, built a raft of flax stems and discovered the now-famous Glowworm Grotto with its millions of bright blue-green lights sparkling on the cave ceiling. A few years later, Chief Tane Tinorau and his wife Huti began Waitomo’s tourist industry and began escorting visitors through the caves for a small fee. The Government took control of the region in 1906 but in 1989, the caves were returned to the original owners and today many of the cave’s guides are decedents of Chief Tan Tinorau and his wife, Huti. Launch your adventures in Waitomo with an exploration of the famous Waitomo Caves. Clocking in at number 14 amongst New Zealand Automobile Association’s “101 Kiwi Must-Do's", the Waitomo Caves are often rated by Kiwi Experience passengers as their favourite New Zealand experience. Slap on a wetsuit with the qualified cavers at the Legendary Black Water Rafting Company, and explore the wild labyrinths that consist of tight crawl spaces, glassy cave pools and cavernous tunnels. Their epic five hour Black Abyss tour begins with a sweet abseil down a 35 metre tomo and includes tubing in an underground river, a pitch dark flying fox ride as well as waterfall jumps, slides and climbs. 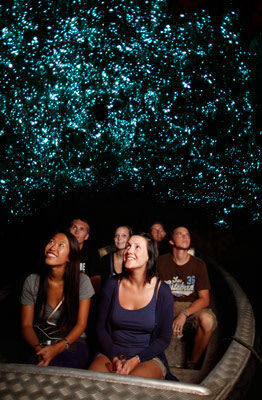 An equal ‘must see’ experience is a boat journey into to the world-famous Waitomo Glowworm Caves. The glowworms, while beautiful, are actually nightmarish creatures that use their bright bluish hue to attract unsuspecting prey in their spiderweb-like threads. That said, you will still stare up in wonderment at the thousands of delicate lights sparkling like stars above your head. As you explore the cave, be sure to also keep a keen eye out for stalactites, stalagmites, cave coral, fossilized oysters and even whalebones. The caving adventures in Waitomo are rated often rated by Kiwi Experience passengers as their favourite activity in New Zealand. While caving is one of Waitomo’s main attractions, the region has also in recent times become a Mecca for Lord of the Rings fans. 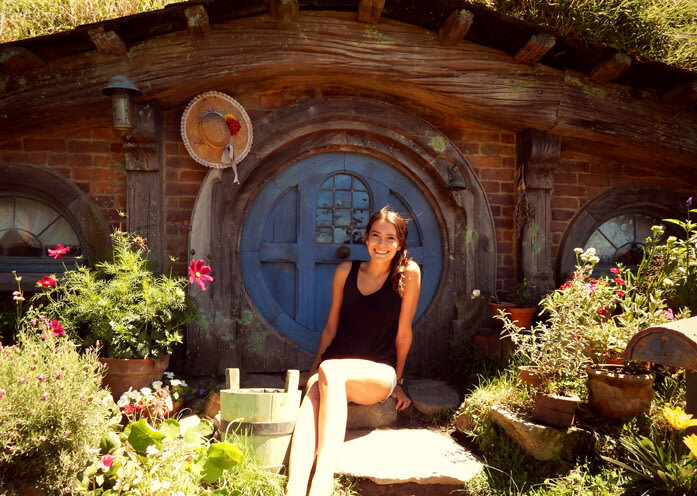 Discover the real Middle-Earth at the Hobbiton Movie Set located at Matamata, about 40 minu​tes from Hamilton. Built by Peter Jackson’s production team, with the assistance of the New Zealand Army, the picturesque 1,250 acres sheep farm land has been transformed into the serene village where Bilbo and Froddo began their amazing adventures in the Lord of The Rings and The Hobbit trilogies. Culture vultures will also enjoy the New Zealand’s first ‘Kiwi Culture Show’ at the working farm, Woodlyn Park. Lonely Planet called it “one helluv’a show”, which features sheep shearing, the Kiwi bear and a dancing pig!Take a two-hour guided tour ($75NZD) around the expertly crafted structures of The Shire, including the 37 Hobbit holes, Mill and enormous Party Tree. Learn how the set was filmed as well as insider tales from the trilogies before finishing up the tour at the Green Dragon Inn for a complimentary ale. Alternatively, if you are looking for some cheap thrills, Waitomo has plenty of free activities to experience. Take one of the great bush walking trails around Ruakuri Cave or visit the 30 metre high Marokopa Falls. While Waitomo is only a small region in the King Country​, it is well equipped to care for travellers with quality accommodation. For an affordable stay right on the doorstep of the Waitomo Caves, we recommend taking a room at the Kiwi Paka. Containing both shared facilities and Chalets with ensuites, the Kiwi Paka contains a communal kitchen and games room, as well as its own Pizzeria where you can enjoy some good food on the sunny deck. Kiwi Experience guarantees that, your first nights’ accommodation is guaranteed in Waitomo.